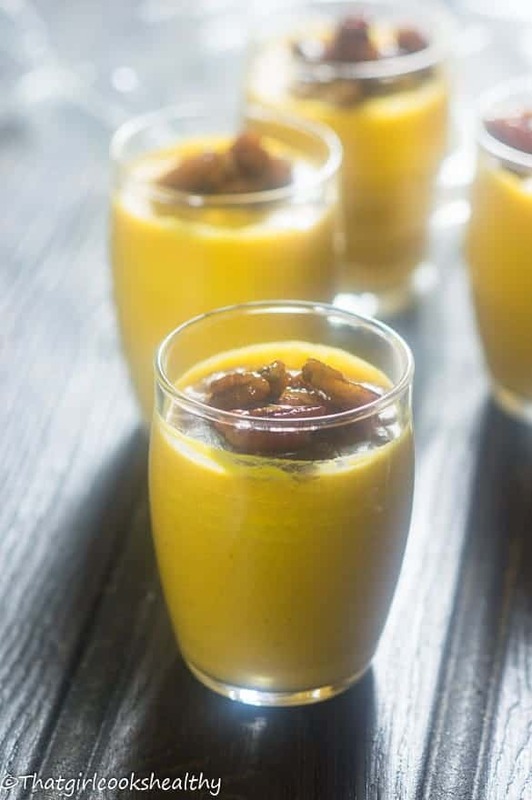 Vegan pumpkin mousse – pumpkin pureed with dairy free coconut milk into a delicious mousse with spicy candied pecans. One thing that I love about the fall is the abundance of autumnal fruit and vegetables. The selection is so great that I sometimes don’t know where to start. One of my favourite things to buy during the cold snap is a big old pumpkin to make some vegan pumpkin mousse. I have a tendency to buy a large, firm pumpkin and calve it up into little bite size pieces and put it to good use. Good use usually translates to Charla cooking and eating it *blank stare* What can I say, the chef has to eat too ya know! If I didn’t eat I wouldn’t be able to supply you with these awesome recipes. Anyway, this vegan friendly pumpkin mousse has your name written all over it. It doesn’t take very long to make nor does it require an amass of foreign ingredients (yay for you). One key element to making the mousse is to include some canned coconut milk, preferably unshaken. The reason for this is you’ll need to scoop out the coconut solids (the creamy texture). This like the vegan version of whipped/double cream – don’t skip this step as it is vital for that rich velvet texture. I have a recipe on how to make pumpkin puree, so don’t be alarmed by this ingredient. It’s super easy to make. The topping really enhances the pre-existing flavours of the vegan pumpkin mousse. The caramelised toasted pecans offer a sweet butterscotch top layer. 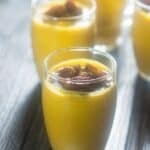 As you dig into the mousse you will instantly taste the spice infused pumpkin with sweet nutty flavour. Carefully use a spoon to scoop out coconut solids from the top of the can into a bowl and discard the clear liquid underneath. In the same bowl now whisk in the pumpkin puree, milk, vanilla and pumpkin spice. Whisk into a smooth consistency and transfer into ramekins or small dessert pots. Prepare the candied pecans by allowing them to toast on medium heat, in a iron cast skillet, for 3-4 minutes whilst frequently stirring. Add the butter until it melts followed by the pecan spice blend. Finally add the coconut sugar and water to the mixture, coat the nuts and continue to caramelise until the sauce thickens. Serve as a top layer for the mousse. Pour the remaining nuts onto some parchment paper to cool before storing in an airtight container. 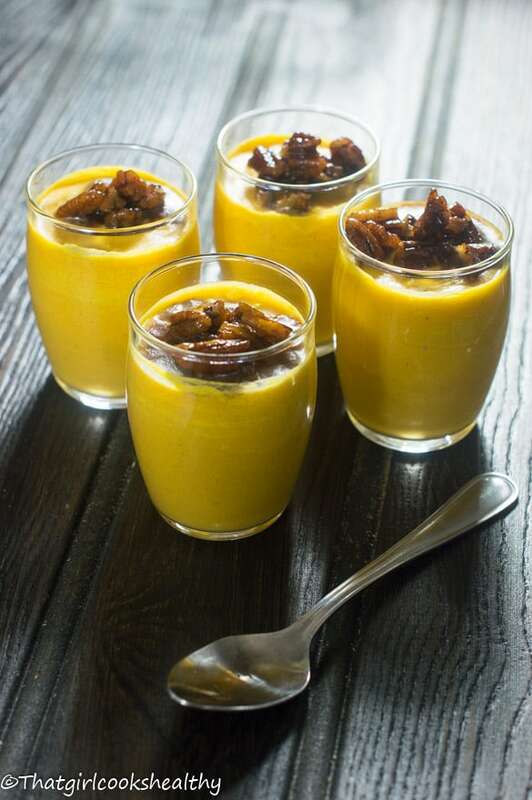 Well, pumpkin mousse sounds incredible — and I’ve never had it. Going to have to remedy that! I really like the flavours you have got going on here! very creative way to use pumpkin! Thanks Jayne. Creativity is my middle name. Pumpkin mousse yes!! 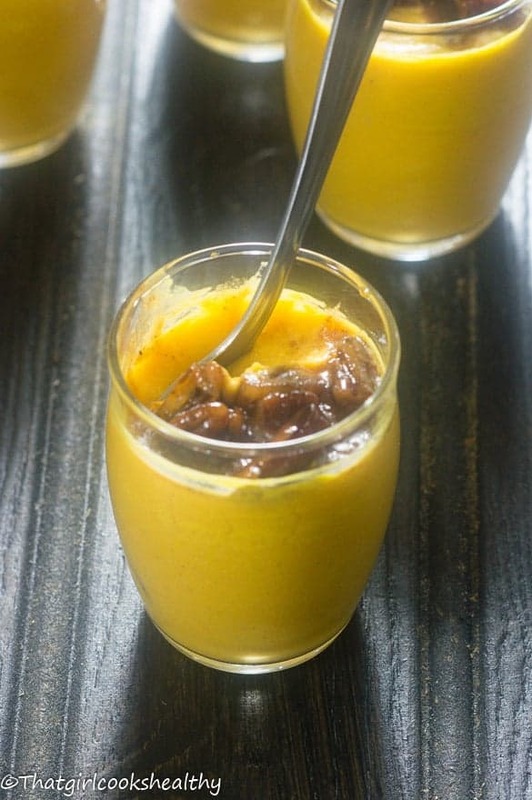 I love pumpkin and mousse so this sounds up my ally. Looks easy and delicious. And spiced pecans? Yes please! Yes! you would love it Sophia. Oh I love mousses but associate them with summer fruits – how lovely to have an autumnal version. Gorgeous stuff! These pumpkin mousses very yummyy, & so brighter. Very easy to make it, I really want to make these.